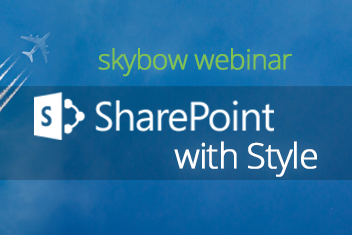 SharePoint with Style - the skybow Theme Designer. Joost from the Netherlands asked if Theme Designer can help in building responsive themes? Unfortunately, classic SharePoint pages are not responsive. So we could actually make the forms part customized using Rich Forms responsive, but the pages will still not work responsively. Luckily a new modern SharePoint page experience is coming, which provides fully responsive pages from the start. We aim to implement responsive forms with Rich Forms as soon as Microsoft makes customizing these modern pages available. The forms can then be filled out easily on any device and will even work with the Microsoft's SharePoint mobile app. Michael from Germany asked where the themes are saved to? The theme definition is stored in a hidden library in the site called “sbThemeDesigner”. If it is applied to a form or a site the file is copied and “themed” in the Style Library of the site collection. Marcel from Switzerland asked how he can get Theme Designer to install on premises? If you want to use skybow Theme Designer in your On Premises environment, you need to configure the app environment for you SharePoint farm as described here. This is possible SharePoint 2013 and SharePoint 2016. Afterwards you have two options to install skybow Theme Designer. You can get it directly from the Office Store or if not accessible you can download an “.app” package from the skybow Portal or by contacting our support (support@skybow.com) and install it to your corporate app catalog.